Whatever you call it, that's not a bad personality trait to have as a defender and Kilkenny's Colette Dormer admits she's got it in spades. A couple of years ago, when her job as an architectural technician saw her based inside enemy lines, she was pucking in the ball alleys in Douglas one night when who turned up only the Mackey twins, Pamela and Katrina. They're two of the anchor tenants on the Cork team who are the Cats' arch-rivals so there was absolutely no way Dormer was surrendering the better of the two courts to them. "I am not leaving until they're leaving!'" she hissed vehemently to her boyfriend. So, eh, exactly how long did you stay? "Nearly two hours! We were there a good bit before them," she reveals, chuckling at the lunacy of it. That trait may also have contributed when herself and Cork's Hannah Looney got involved in a bit of shoving during the pre-final handshakes two years ago, about which she now looks a bit sheepish. "I honestly don't know what happened. We were just so hyped up for the game. Thankfully I didn't get too much bad abuse for it but Hannah did (online) and that was terrible." She "reached out" to Looney at the subsequent All-Stars do and the hatchet was promptly buried. Yet that stubborn streak, a personality trait she reckons comes from her Laois mum - "well that's what Dad says anyway" - is something that has probably served both of them well. Dormer is one of the players featured in Liberty Insurance's current 'Camogie Made Me' campaign and her video is particularly poignant when she sits down to study some photos with her mother. "Mam was diagnosed with cancer in 2007, a tumour behind her eye," she explains. "It was the week that I was starting college in Waterford IT, and the night she told me she had cancer she made me promise not to give up sport. "She had radiation, chemo, surgeries, the lot. She's had a long tough battle but is healthy now thank God, but they were a tough two years. She is the rock of the family, still does everything for us all. She's my real inspiration. "She really didn't want me to lose camogie at the time and she was so right. It was my outlet and it was the (camogie) girls who came around me and kept me going at that time." Dormer's refusal to take a step back has also helped her maintain her relevance in a team where she is now a 29-year-old veteran and sometimes has had to battle hard for a starting place. The Paulstown defender was only 17 when she joined the county seniors over a decade ago, already an All-Ireland U-16 and double minor champion. She won four Ashbourne Cups with WIT where her team-mates included Cork's Laura Treacy, but like many of the current Kilkenny team, a senior inter-county All-Ireland took a long time coming. She is ideally placed to assess all five of their recent finals and their duels with Cork. They lost to Cork in 2009 when "we had a lot of young players and they gave us a bit of a lesson". "We beat Cork in the 2013 semi-final and then met Galway and maybe we looked a bit too far ahead after beating them. As much as we were disappointed, that was the game where (Galway's) Therese Maher finally won." A year later the Cats were back and facing Cork again. "That was a tough one to take. I always remember the dressing-room afterwards and Ann Dalton saying to 'bottle the hurt'." Two years on they returned with one significant change which helped their undoubted talent to finally bridge Kilkenny's surprising 22-year wait. "We had Ann (Downey, manager) back in 2016. She really pulled the panel together and brought in a lot of new players, freshened it up and drove it on." 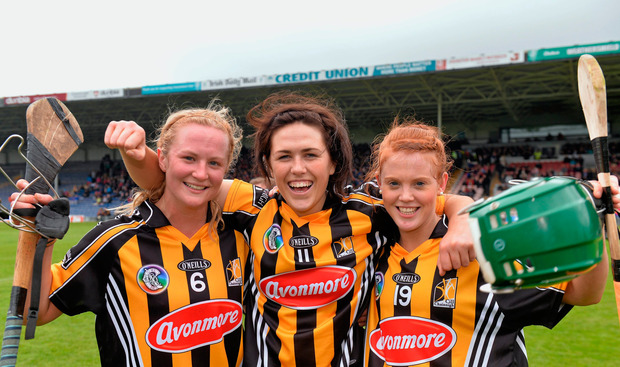 Last year's third Kilkenny-Cork final in four years was a goal-less arm-wrestle in horrible conditions but climaxed sensationally when Cork's Gemma O'Connor equalised from downtown and Julia White's 67th-minute wonder-shot edged the Rebels home. Was Dormer within tackling distance of her? "I think everyone was," she groans. "We were looking at a picture of it after and honestly couldn't understand how none of us got to her." Dormer may not always be an automatic pick but she has no problem with that. "I'm not one that's put down on the page first, you'd struggle at times but that's a good thing, that makes you work twice as hard to try and hold a position down. "Ann picks who is playing well in training which makes each training session a real battle," she says. So a bit like the Kilkenny hurlers' notoriously feisty sessions, then? "Ah no, we haven't got to fists at training yet!" Dormer grins, well primed for the latest instalment of this fascinating camogie rivalry. Croke Park, tomorrow, Live, 4.15, RTÉ2. Julia White’s extraordinary strike in the seventh minute of injury-time was all that separated them last year. Only a point, in Kilkenny’s favour, divided them again in this year’s league final and this is their third consecutive All-Ireland final so it will be hugely tactical. Cork are noticeably less dependant on Orla Cotter for scores now. White is back starting and Chloe Sigerson’s long-range shooting from wing-back is another asset. With Rena Buckley now retired, Gemma O’Connor remains Cork’s defensive general and Anne Dalton’s sweeper role is equally vital for Kilkenny. Two tough games against Galway mean Kilkenny arrived battle-hardened. What part Briege Corkery, just back after a two-year hiatus, could play is fascinating and it might be in defence. Just one point could nick it again and don’t rule out a draw. Cork are desperately hoping it’s third time lucky after losing the last two finals, including a replay last year. They won Division 2 this year and have beaten Down twice this season. Down, who won the premier junior four years ago, shocked Tipp in the semis but they face a team who cannot countenance defeat. Dublin are looking to avenge last year’s defeat by Westmeath and win their first junior since 2006. Kerry are looking to make history in their first visit to Croke Park. They won Division 3 this year, something Dublin did last year.